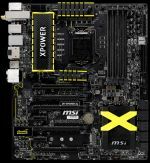 One of the nice bundled accessories with this Z97 XPOWER is the MSI Delid Die Guard. 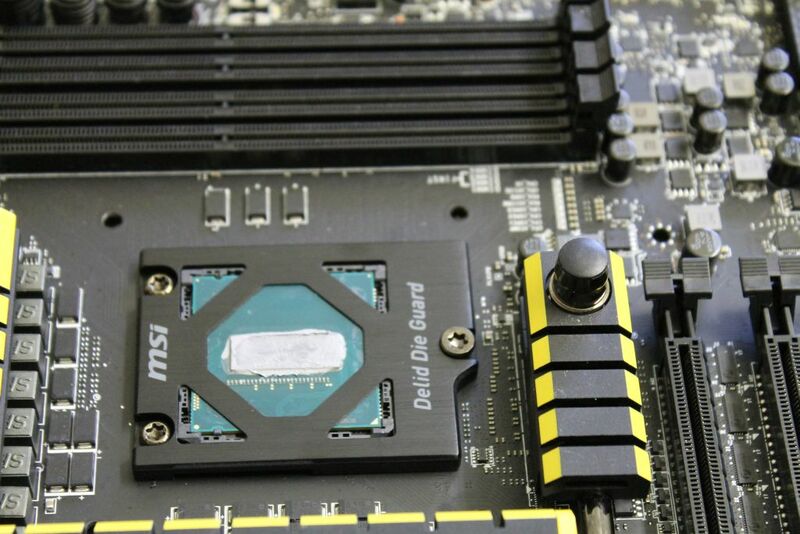 If mounted it replaces the normal LGA 1150 latch locking mechanism. Ideal when using a delidded Haswell or Devils Canyon Processor. We delidded our i7-4790K Engineering Sample via the traditional razor blade method. 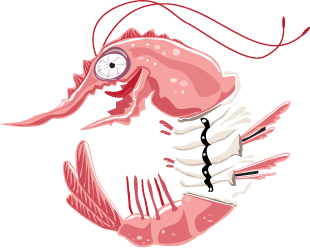 No redneck method with hammers at the MadShrimps office ! 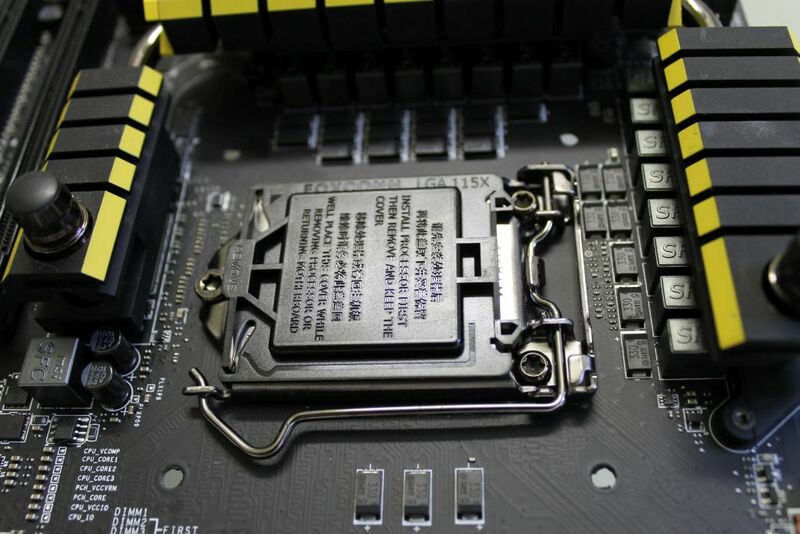 The Delid Die Guard assures the optimal mounting pressure and thus protects the core from being crushed by the utilized cooler. We only tested the Noctua air cooler and the EK Water blocks Supremacy water cooler and even after numerous remounts the processor core was still in mint condition. Take note that the Delid Die guard is not usable for Extreme cooling methods as it has a negative effect on the total OC. To unmount the stock mounting mechanism one needs a Torx screwdriver, too bad MSI didn't include one in the package. 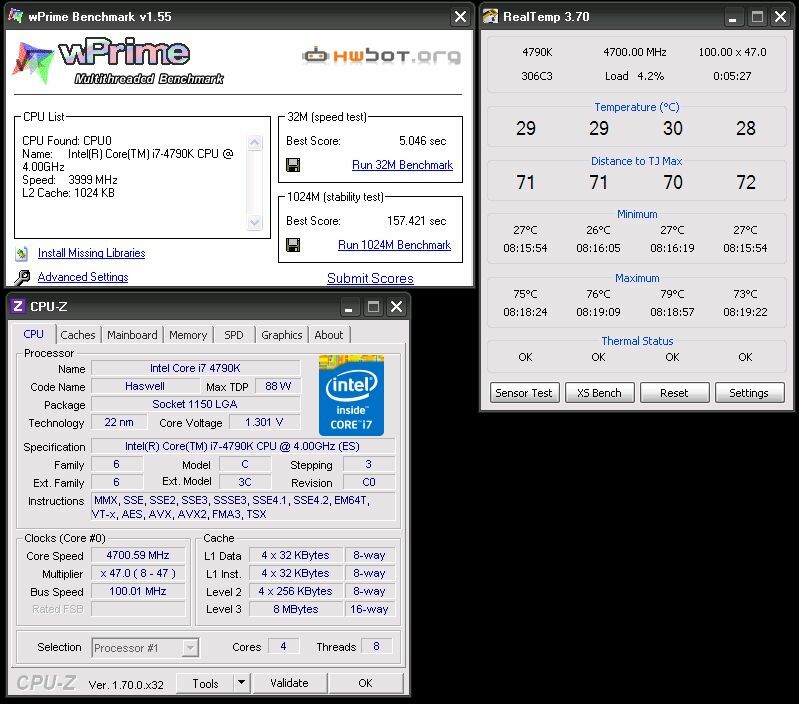 We have to admit our i7-4790K ES was out of the box already a quite good performer in both overclock as in Temperature output. Stress testing via AIDA64 software was no problem at 4700MHz at 1.3Vcore, however to keep testing reduced to a minimum we just reran 3 loops of WPrime 1024. Included in the charts are the stock processor, the delidded version with Gelid solutions GC grease and the original IHS put back on and finally the naked processor (Die Guard) with direct contact with the Noctua Air cooler. Depending on the processor and cooling used your mileage can vary. The biggest temp gain is achieved after removing the IHS and redoing the Intel Thermal paste with the Gelid Solutions GC Extreme Thermal paste. A temperature drop of close to 10°C is an excellent result for a 5 minute job. 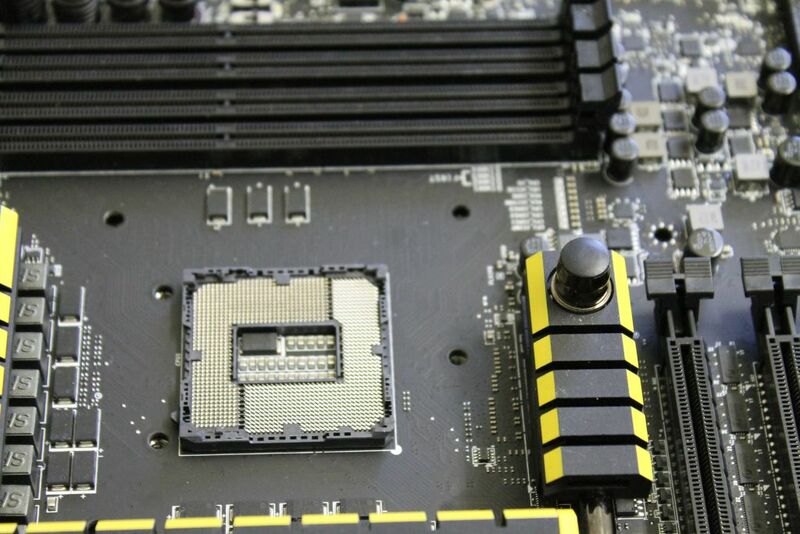 Enhancing stability and longetivity of your Haswell Processor. 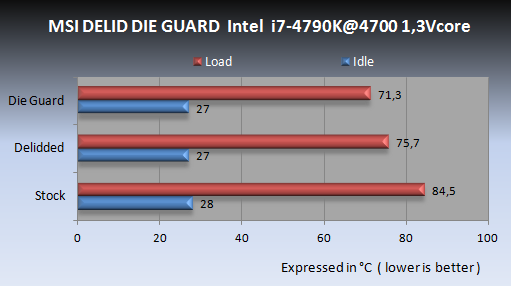 After installing the Delid Die Guard another 4°C was gained versus the delidded results. 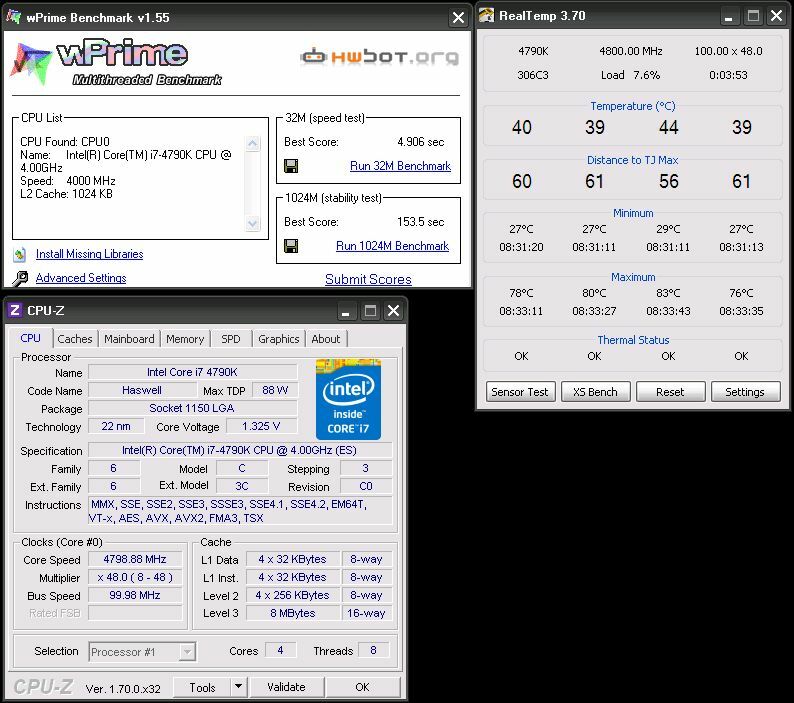 Best of all was we could benchmark our CPU even 100MHz higher with a slight bump in voltage. 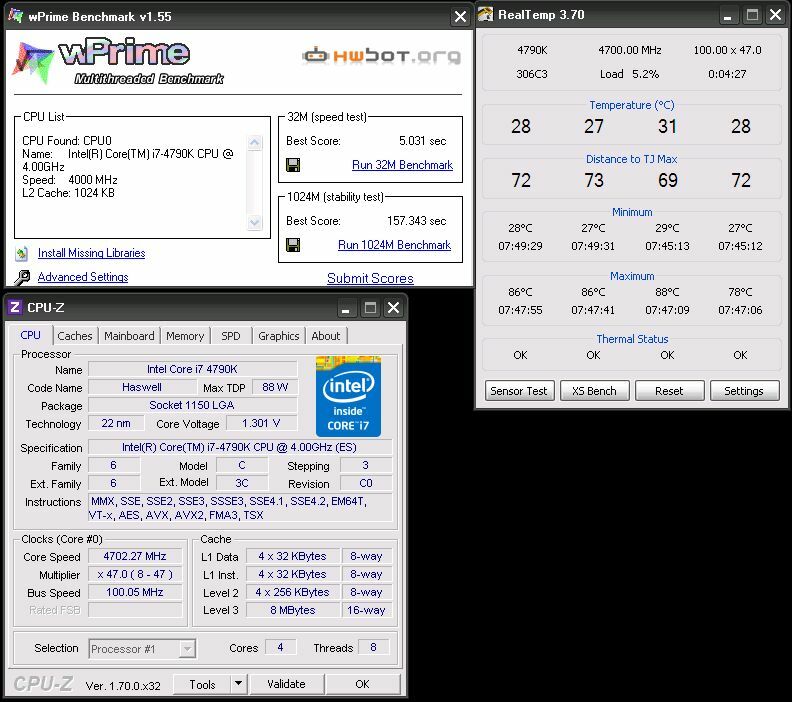 The output temperatures were only slightly higher than when being tested at 4700MHz which is in fact what this Delid Die Guard is all about.